Who would've thought that for all these years I've been doing it wrong! It wasn't until a fruit-loving missionary friend schooled me that I learned the error of my ways. As I was reaching for a knife to cut the stem, he stopped me and instructed me to open it the way the monkeys do. Um, O.K. ; I guess they would know. With that, he turned the banana around and opened it from the bottom. Seriously? I've spent my entire life doing it wrong? As long as I'm being schooled, do you know of any simple tip that I may be missing? I'd love to know, so please leave me a comment! Lisa, I must admit, I have been doing both of these things wrong as well. You are surely not the only one. At least I am in good company :) May we be ever learning all the days of our lives! So glad I visited from Tell Me A Story this morning. Now I need to go peel my morning banana - correctly! So then you stick your thumb in the middle and push it through the whole banana. The banana splits into three neat pieces, AND you can now see the seeds pretty well. This works from the stem end anyway. I just peeled three bananas to make an apricot yogurt smoothie and sure enough I did it wrong. I loved your post. Thank you for sharing with us here at "Tell Me a Story." Hi from the Kitchen Hoors blog hop. I've heard that, but always forget. Apparently I'm not good with change either!! One good tip deserves another! My simple tip is for grilled cheese. Don't melt the butter in the pan. Spread the butter on a piece of bread. Put it butter side down in the pan. Put cheese on top of bread in the pan. Putter another piece of bread. Put it on top of the cheese, butter side up. When you turn it over, the butter side will hit the pan. If you don't have butter, mayo works too! Funny! It's the Butter Battle Book all over again! Thx for sharing on Think Tank thursday. 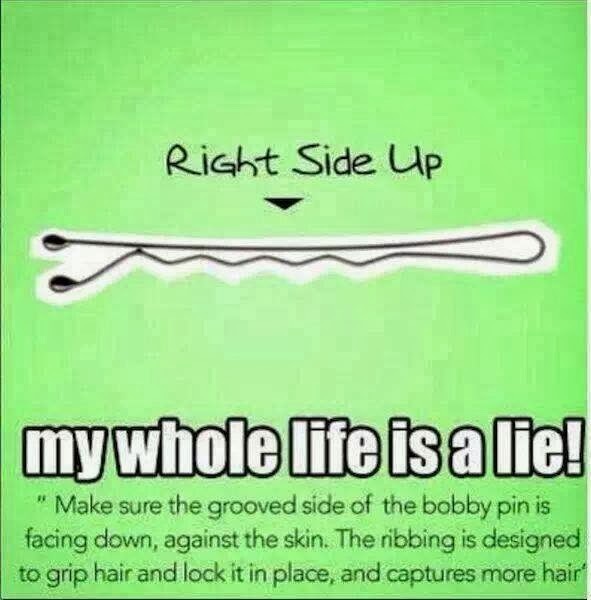 I did not know that about a bobby pin. Wow what else am I doing wrong? lol Thanks for sharing on the Wake Up Wednesday Linky!! Now I will never peel a banana the same way again! I don't use bobby pins but that is very interesting! I knew the banana thing, my sister-in-law is from Sweden and they now live in Singapore and apparently they do it the right way in one or both of those places. But the bobby pin thing is new to me. It makes sense I just never thought about it. I'll be doing that for my daughter's hair now. Thanks so much. Don't feel bad, I have been opening a banana wrong for my whole life too. I have heard that about the banana, but still I open it from the stem side by breaking/bending it. I don't use a knife. The one about the bobby pin....it makes perfect sense, but I've never heard of it. Thanks for sharing with us at The HomeAcre Hop!